"This is a special recipe bar-b-que brisket that is slow cooked in the oven. Enjoy, this can be cooked outdoors on pit if preferred." 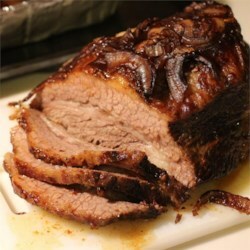 Place brisket in a large roasting pan (disposable aluminum foil pan is fine). Pour beer over the meat, and place onion sections on top. Season with garlic, salt and pepper. Combine the barbeque sauce, molasses and liquid smoke; pour over the roast. Cover pan with aluminum foil. Place pan on the center rack of the preheated oven, and bake for 6 to 8 hours, or until beef is fork tender. Remove from the oven and let stand for about 10 minutes before slicing across the grain into 1/8 inch slices.